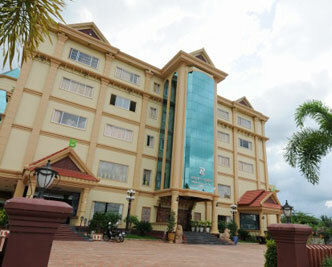 President Bttambang Hotel City is excellently located in the heart of Battambang Town and a leisurely 15-minute within walking distance of the nightlife and colorful markets with a variety of shops, tour agencies and restaurants, and seven (7) kilometers from the famous temple of Angkor complex, one of the man-made wonders of the world and also the hotel offers 24-hour security to ensure your safety. Each room are very clean, tidy, spacious and decorates with a modern amenities and wooden furniture includes a color cable television in multiple languages and more than 80 channels, large window with a good view of the Siem Reap Town and many more great features, President Battambang Hotel City is a favorite choice of accommodation when travelling to visit Battambang city, the Kingdom of Wonder! ※Kindly note that an additional booking fee of USD 6 per room per night is to be added upon reservation.